Hooded jacket: 41cm 3 balls, 46cm 4 balls, 51- 56cm 5 balls, 61cm 7 balls, 66cm 8 balls. V neck cardigan: 41-46cm 3 balls, 51-56cm 4 balls, 61cm 6 balls, 66cm 7 balls. Based on 50g balls mixed fibre yarn. Tension: 20st/ 32 rows to 10cm over pattern, 4mm needles. 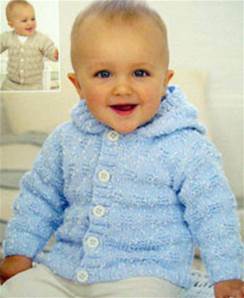 Shown in Tiny Tots Dk, also suitable for Snuggly DK, Baby Bamboo, Baby Crofter or other baby DK - amount may vary.3.25mm and 4mm needles, optional 3.25mm circular for V neck cardigan, st holder for hooded jacket. 41-51cm 4 buttons for V neck, 5 for hooded: 56-66cm 5 for V neck, 6 for hooded.